Home - News - Baby-Friendly Initiative 2019 Symposium –Save The Date! 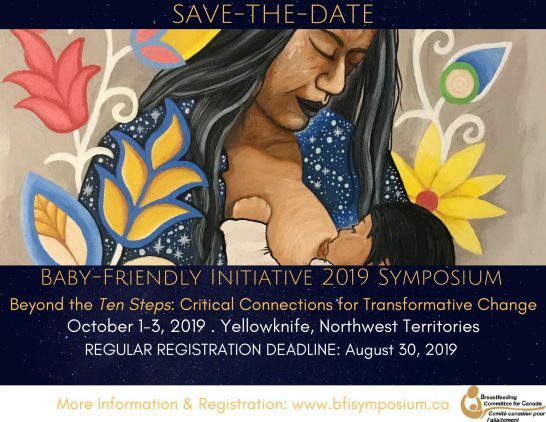 The Breastfeeding Committee for Canada presents a three-day interactive symposium with experiential learning opportunities that will investigate how health equity and social justice approaches can inform the Baby-Friendly Initiative and its implementation in Canada. It is well known that families and communities in Canada can experience significant disparities in breastfeeding rates and access to support. Constraints are caused by unmet social determinants of health and a range of injustices including gender inequality, racism, poverty and violence. Participants will learn how to move beyond the organizational practices and to build the critical connections necessary for transformative change in breastfeeding promotion, policy and research.